in Bridgton, ME on Saturday, April 21 and Sunday, April 22. Help beautify your community in the morning and stretch your legs the following afternoon with a hike to the summit of Bald Pate Mountain. 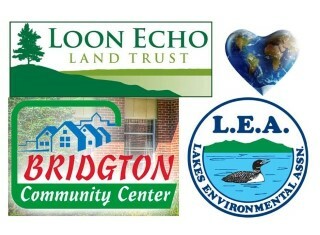 Loon Echo along with, Lakes Environmental Association (LEA) and the Bridgton Community Center, are hosting an Earth Day Cleanup on Saturday the 21st starting at 9 a.m. at the Bridgton Community Center on Depot Street. This year participants will be giving back to the community and focusing on the downtown Bridgton area. Before rolling up our sleeves, Loon Echo and LEA staff will take a moment to remember former LEA staff member and close friend Adam Perron, who helped establish the Bridgton Earth Day Cleanup in 2015. After cleaning up, the Bridgton Community Center will provide a free picnic for participants. Work boots, gloves, bug spray and water are recommended. This program will run approximately four hours. The following day join volunteers and friends from Loon Echo, for a 2-hour afternoon Earth Day Hike to the rocky summit of Bald Pate Mountain. Participants will meet at the main parking area on Rt. 107 in Bridgton at 3 p.m. At the summit hikers will share music, poems or stories that embody the spirit of the day. Sturdy hiking boots or shoes, water and snacks are encouraged for this moderate hike.